Start/finish: 1/15-1/17/09. Fast, fast, fast. 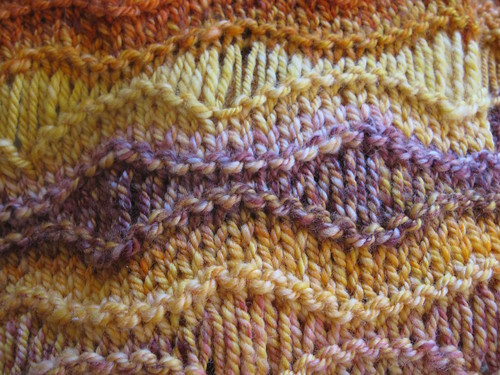 Comments: The colors of the yarn reminded me of Tucson sunsets, hence the title. 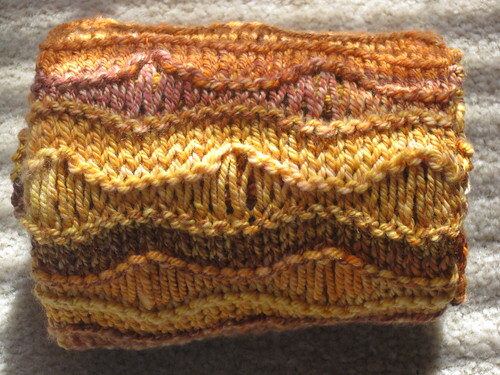 The yarn was bulky (~10 wpi), so I cast on 26 stitches for a scarf that ended up about 6 inches wide. I also found that my dropped stitches were really long, so I decreased one yarnover for each dropped stitch (i.e. I did yo, double yo, triple yo, double yo, yo instead of the pattern as written). The finished scarf is 6 x 78 inches - plenty long enough to wrap several times around my neck, or double over and pull the ends through. My attempt to blend the white sections of top with more saturated bits did not work out perfectly. 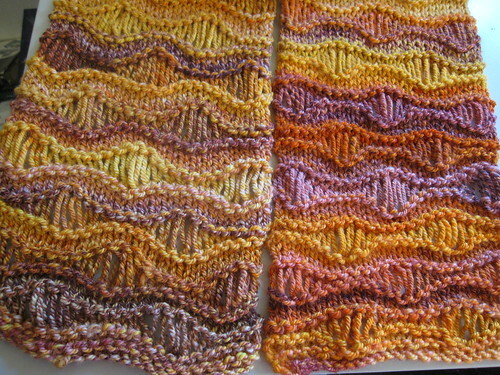 You can see that the end of the scarf on the left was from the skein that had more of the white in it, and the right side is from the skein that had the deeper colors, but it's not terribly obvious when the scarf is on. One thing that I liked that came out of the spinning method I choose was the almost-tweedy look to some of the singles, where I had multiple colors in one strand, that when plied together came out looking almost mottled. I like how those sections knit up alot - the fabric has a lot of depth and interest to it. The colors are perfect for dark, grey winter days. Unfortunately, winter in Houston seems to be over - it was in the upper 70s today and just stunningly beautiful - so this scarf may not see much us until next winter. Which I hear starts in September or October across the pond. So hopefully by then I'll be well supplied with scarves and hats and suchlike. 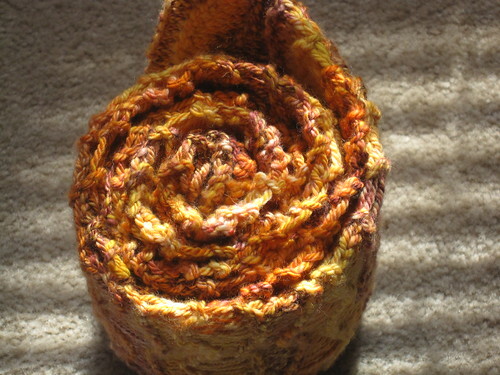 Written by porpoise On January 23, 2009 In "FO", "scarves", "spinning"